Newcastle may not be featuring in the FIFA World Cup, but Avalon Guest Manor has put the town on the proverbial map. Avalon Guest Manor was awarded a clear-out winner in the Guest house Lodge with dinner arrangement in the AA travel Guides American Express Accommodation Awards at a glamorous event held in Durban this week. The Manor, which was born three years ago stood out in its category with ho highly commended entries coming close but rather four finalists from as far as Nelspruit, Standerton and Cape Town. Since its inception, Avalon has stood out at the awards ceremony and was a finalist in 2008 and runner up in 2009. The guest lodges have been chosen by guests to be winners in their respective categories. According to the AA Travel Guides American Express Accommodation Awards officials, each guest house not only met but exceeded the expectations of their guests. Avalon’s Siephan Price said their winning recipe included exceptional emphasis on detail, personal attention to guests and value for money. Mrs Price added that staff had taken ownership of the Manor and were beaming with pride from their newest medal. 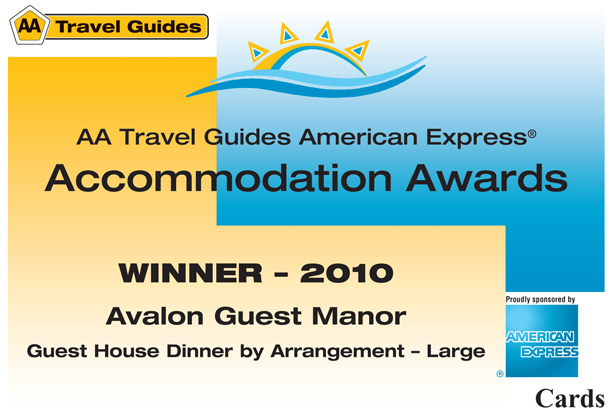 Newcastle’s only Five Star accommodation establishment Avalon Guest Manor has successfully been awarded second place in the prestigious 2009 AA Travel Guides American Express Accommodation Awards Programme. The awards programme now in its sixteenth year recognises and rewards service excellence in the South African hospitality industry. It is the only established mechanism that consumers can use to express their views about the quality of tourist accommodation in South Africa. With the 2010 Soccer World Cup Tournament around the corner it is critical that the industry establishes credible standards of excellence and service. The programme has become a major component in the build up and sale of South Africa as a successful host of the tournament. High scoring establishments in the programme are carefully examined and visited by qualified and experienced assessors to verify that high scores are justified.